Bacon and egg banh mi? Steak? Or traditional? Destination Roll have opened up in a number of places across Sydney, specialising in banh mi and some unique rolls in Vietnamese pork roll style and flavours. Aaah, the banh mi. 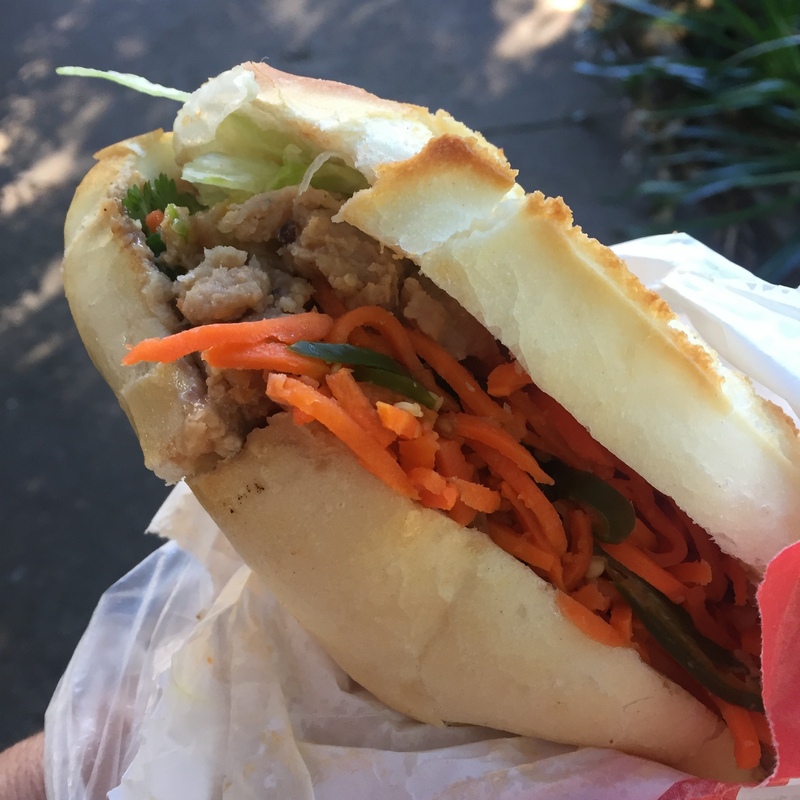 The Vietnamese pork roll has ridden the roller coaster of popularity over the last few years and has stuck around to become a lunch time staple for suits and students alike. We're big fans, as office-job-by-day workers, its great to have a quick and mobile lunch option that doesn't break the bank. Destination Roll have set up their menu with just a few options. Choose from white or wholemeal rolls. They don't have a complicated pricing system - every roll is $5.50. Extra salad is 50c, extra meat is $1.50. While $5.50 is higher than the rolls out west, it's still on the cheap side for city siders. Look out for the occasional special, we've seen them do three rolls for $10 for a limited time. Classic pork roll. A slice of each of the white and pink coloured pressed pork slices and a couple of rounds of roast pork, packed with orange shredded carrot, cucumber and green onion. They also use a slightly pickled green chilli instead of the fiery slices of red 'scud missile' chillis (aptly named by David Thompson!). The roll is crisp and fresh which always adds bonus points. Crispy pork roll. Want a pork roll with hunks of pork crackling? Try this one. Watch any crowns or loose fillings in your teeth as the pork crackling is hard and tooth crackingly crisp. BBQ pork roll. This roll is filled with the regular salad mix and one giant slice BBQ pork, very similar to the Singaporean bakkwa. The sweet pork has a good texture and gives a large amount of flavour for just one slice. Meatball Roll. The meatball roll is one of our favourites. Vietnamese style pork rissoles in a tomato sauce, you can't go wrong. Add in some salad, it's almost healthy! We love the mix of the hot rissoles and the fresh salad all held together in a crisp roll that slowly soaks up the sauce. Steak roll. This roll is a hugely generous serve of saucy shredded beef mixed in with a touch of salad. A fantastic way to get a protein fix. Bacon and omelette roll. The concept of this roll intrigued us. We'd had an amazing omelette roll delivered though the window while stuck on a train between Danang and Na Trang. It set our benchmark for how good a simple roll could be. This one though, was heavy on the mayonnaise and was a little sickly and oily. We would have loved a little more salad and less mayo. Chicken roll. The chicken roll is served with shredded, warm chicken inside the crispy roll. It's generous and filling. Tuna roll. When you order the tuna roll, select from a range of different flavoured Aldi brand tuna tins at the front counter, including lime and cracked pepper, smoked tuna or tomato and capers. We went down the tomato flavoured route, and this roll was surprisingly good with it (the tuna is hidden behind the orange shred). They don't add any pate to the tuna roll so it is meat free. Destination Roll is along happy valley on Broadway at 149/145 Broadway, Ultimo. There's also a store in East Central at 88 Wentworth Ave, right near Spice I Am and one near Mascot train station that we've spied. Other stores in Cabramatta, Eastwood and North Sydney. If you find yourselves on the First Class end of town close to Circular Quay, there is a great little mom 'n' pop (mom 'n' auntie actually) Vietnamese place in the cramped subterranean food court/tunnel in Dalley street, just off George (you can also access from Bridge street). They'll fill (and i mean fill) their roll with roasts of the day if you ask, the rolls are crispy, and the service friendly. Only downside is the price ($8.50 for one with the premium fillings, but cant fault their generosity) but that still makes it the cheapest lunch that side of Bridge street, and I reckon their rent must be ridiculous, so I feel for them. They do a pretty mean pho and pork chop too. Thanks for the hint, we're rarely First Class but always classy! I'll put that on our eating list. I feel an end of town investigation coming on. The George St works make it hard to get down there easily from our side of town but this sounds too interesting to resist! I do agree with Stan, but i need to point out that the other stalls in the food court are pretty vanilla, including one that appears to appeal to the kind of people that try to maximise protein in their diet and avoid gluten for no good reason. I love Destination Roll! Love the quality pate, the crispy and warm rolls, the fresh fillings. I work in North Sydney and there's always a queue for the one there. Crispy pork roll is my go-to but unfortunately it is everyone else's too it seems, so they run out of roast pork quickly. If they do, go Plan B: Get a regular pork roll and ask for crackling in it as an extra ($1)! Amazing!!! Great tip on the extra crackling! Shatteringly good.